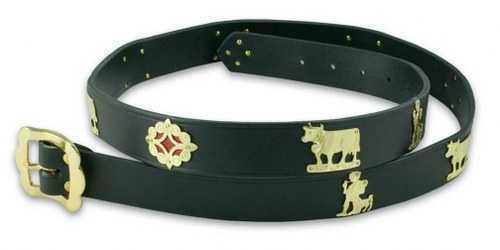 Black leather, 1-1/4 inch wide with brass buckle and Appenzell accents. For best belt sizing, PLEASE measure the total length of your favorite belt. Then order by the size below. Sizes: 31, 33, 35, 37, 39, 41,43, 45, 47, 49, 51, 53, 55 inches. Service Area: New Glarus, Beloit, Janesville, Freeport, Rockford, Sun Prairie, Baraboo, Fort Atkinson, Oregon WI, Platteville, Verona and surrounding communities.